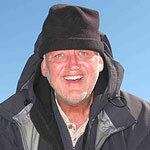 Baz lives in North Norfolk and has been to Kamchatka and Chukotka on two previous expeditions. In 2011 he was an integral part of a small team which discovered Spoon-billed Sandpipers at a new breeding site in Northern Kamchatka, and is passionate about this important project. He is a trained ecologist/conservationist having obtained an Hons degree in Ecology from the University of East Anglia and worked in the UK for Natural England and The Wildlife Trusts involved with bird and plant surveys. Baz now runs his own business in Norfolk involved with Wetland restoration.